2.8 million people benefited from work supported by U.S. donors in fiscal year 2016. Thank you for giving generously to transform the lives of children and families in need. 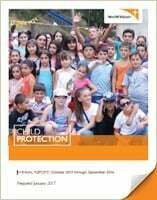 Through our work in Armenia, Bangladesh, Cambodia, Kenya, and Mozambique, we are changing the attitudes and behaviors that put children at risk. It is challenging work. It takes time. But our mission could not be closer to the heart of God—because it is His precious children we are protecting. Thank you for being part of these efforts in fiscal year 2016. 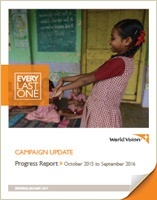 This report celebrates the progress we made together. Please pray for continuing safety and healing for children who have been hurt. We ask God to help us reach even more children this year. 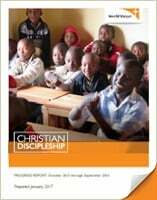 We are excited to announce the launch of three new Christian Discipleship projects in fiscal year 2017. These include the Philippines, Central America (El Salvador and Honduras), and Ethiopia. We are humbled and grateful for your faithful commitment to helping local churches in their ministry and ensuring that children and youth have abundant opportunities to learn about and experience God’s love. Without your prayers and support, none of this would be possible. Thank you. 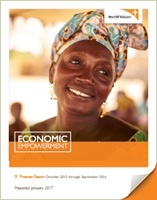 Along with the THRIVE initiative, World Vision and VisionFund, its microfinance institution, also are providing access to financial services for rural farmers and other vulnerable people. 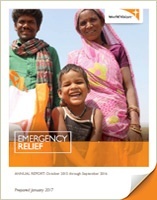 In 2016, World Vision reached 15.4 million people in disasters and crises with life-saving aid and critical relief. Some of these disasters dominated the news, but most received little attention. Through the support of grant funds and our private donors, $401 million in humanitarian aid was provided to people across the globe. But these figures do not capture the true impact of your support. Reaching someone in their greatest hour of need provides so much more than food, water, or shelter—it reminds them of our linked humanity. It restores hope and dignity. It is our faith in action. 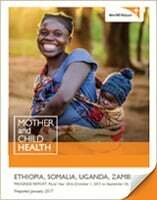 Thank you for partnering with World Vision in this humbling work. Thanks to the ongoing support of Africa Water, Sanitation, and Hygiene (WASH) donors and partners, we have reached 10.8 million people with clean water since October 2010. Through this continuing program, we are bringing the life-saving benefits of safe WASH to even more people in Africa, with the vision of reaching every person, everywhere we work by 2030. 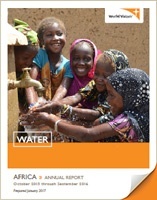 This past year, your generosity enabled World Vision to scale up the Africa WASH program from 10 to 25 countries. Further, in-country teams are securing partners and additional funding to support their WASH programs, as shown in the spending graph at the bottom of the page.